1. Do you find times where you just don't feel "into quilting"? Oh yes. Unfortunately now (when I haven't been able to work on quilts) is not one of those times. 2. Is there a season that you tend to be more quilty? Winter, maybe. Usually I quilt all year round though. 3. How do you pull yourself out of a funk? Just keep going - but on the other hand, if I'm working on something that I really hate working on, maybe it's time to put it down and work on something else. 4. 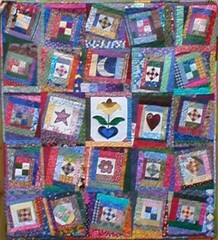 Do you find that quilting is good therapy when you are down? It can be, yeah. I've quilted my way through some of the worst years of my life. 5. Are there times when quilting is a wee bit consuming in your life? Oh, sure. Especially when I'm trying to get something finished. I want to just not stop til it's done. Bonus photo: this was made during the years when I was very depressed. Doesn't really show, does it? Sometimes I lose track of time when I am trying to get things done!